I recently found your website. My father, Marvin T. Keith, was on the USS Reid at the time it was sunk. He died March 3, 1979 of a cerebrovascular accident and diabetes. He had a successful career as a sales person for a heavy equipment company. Through the years, Dad suffered a good bit from the shrapnel in his groin and legs. I appreciate the work and effort you have done on the website and look forward to sharing it with Dad's children and grandchildren. You can find these hats on the internet. Try militarygifts.com. Another one is militarybest.com. Congratulations to your dad on reaching the 89 mark. I'll be joining him at that mark next month. We have quite a few shipmates in their 90s too. I hope you have shown your dad our ussreid369.org website. I've spent the afternoon reading papers saved by my dad, Charles Stapleton, LSM-42 Group Staff Six lead signalman. He witnessed the sinking of the USS Reid from the conning tower of LSM-42. His ship shot down the ZEKE which made the suicide dive into the Reid. I also have his copies of the declassified Confidential action reports of the USS LSM-42 regarding the sinking. I'm reading a letter to Scott MacDonald, Associate Editor Surface Warfare Magazine. It's all very interesting and I wish now that I had sat and actively listened to all my dad's stories and recollections. He wanted desperately to tell the story to anyone who would listen. Just wanted to connect with you, as I am sure my dad would have had he not passed away before the internet became such a part of day to day life. Please be informed that Sea 2/c Charles “Gordon” Johnson passed away on Thursday September 2, 2010 at the age of 87 years old. Gord was aboard the USS REID during its final mission up until its sinking on December 11, 1944. Charles “Gordon” Johnson was born on December 20, 1922 in River Rouge, Michigan. My name is Mark Goodrich. 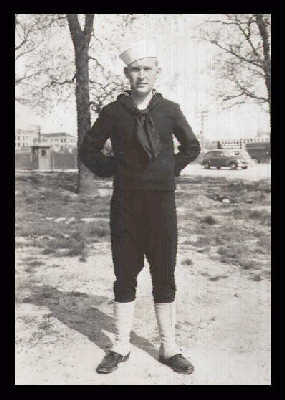 My Father, John E. Goodrich, served on the USS REID 369 from November 1942 to February 1944. Last Saturday Dad pasted away after a long struggle with Alzheimer’s. I discovered your site about a year ago while researching Dads history and experiences in the war. On behalf of my family, thank you so much for all the work you have done so that we may understand more fully the great sacrifices and courage shown by our Dad. I am sure many other families have by touched by your efforts. Attached is Dad's Obituary which speaks to his life and leagcy. I also attached a picture of both Dad and my Mother (I noted you posted pictures of "REID Sweethearts"). Please feel free to post or distribute in the REID's publications. Good to hear from you, though sorry to hear that our shipmate has passed away. There are not many of us left. I have very little information on your father, Charles Young. He enlisted 2-23-1943, came aboard 6-19-1943 as a Seaman 2/c probably in Pearl Harbor and became a Sonar Man. He was Sonarman 3/c when the ship went down 12-11-1944. He was not listed as wounded. As a sonarman, he probably had duty in the radar shack on the bridge where I was a signalman. I probably knew him at the time. I would very much appreciate having more information about your father: where born? When born? Family background? Why choose Navy? When left Navy? What he did as a civilian? Also, please email me some pictures, especially those from war years. A picture of your father and mother when they were young, such as a wedding picture. If you can't scan them, send them to me and I will scan and return them promptly. I am contacting you in regards concerning my Father, Charles Young. He was on the USS Reid. He passed away August, 1970. He never talked much about his experiences during the war, but, I would greatly appreciate any information you might have concerning my father. My email address is:ricky@impulse.net , or if you have any correspondence my address is: 1017 North Jasmine, Lompoc, CA. 93436. I just wanted to say thank you on this Memorial Day for creating and maintaining the web site for the USS Reid. 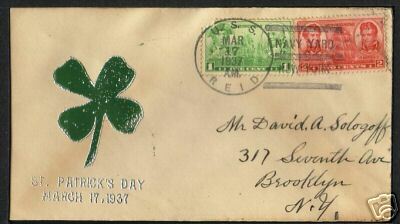 My father, John Donovan, served on the Reid but, like many servicemen and women, he did not talk about the war. Your site has given my family an important connection to that part of his life. The film was taken by a 23 year old woman on 8mm film. It sat in a box in a home for half a century. The women's son then had the film transferred to DVD so the old woman could relive old family memories. She passed away a few years ago. This past week her elderly son was watching "The Pacific" and recalled the old footage. He contacted Channel 7 in Brisbane on Thursday and they were around in a flash to collect it. So Channel 7 found it not me. I was just rolled in as the so called "expert" to comment on the find. Our webmaster passed your inquiry on to me as the ship's historian. I have only basic information on your uncle. He enlisted on December 22, 1943 and came aboard the USS REID on August 10, 1944 and went down with the ship on December 11, 1944. Orvis came aboard the REID when the ship was in Pearl Harbor for overhaul, having been in the southwest Pacific for nearly a year, most of the time in heavy action in the area around New Guinea. As was common in those times, when experienced ships came into a home port, experienced crew members were siphoned off to man new construction and replaced by newer recruits. This was the case in August, 1944. More than 60 were transferred at that time. Your uncle was one of the new crew members to come aboard. I don't have a record of what your uncle's battle station was, but as a seaman, he most likely was on deck manning one of the guns or in the magazine moving ammunition to the deck. Most of those lost when the ship went down were stationed in the engine room or manning the after guns or magazines. That is where the devastating damage was done by the kamikaze strikes. That is about all I can tell you. However, you might be able to help me. Do you have a picture of your uncle in uniform? What can you tell me about him? Where born? When born? What did he do before joining the Navy? We will add whatever you have to our website about your uncle. Hello there. My name is Dennis J. Orvis. I'm doing some research on a uncle of my that was on the USS Reid with your dad when it sunk on 12-11-44. His name was Carol W. Orvis, he was 1 of the 108 who were K.I.A. I would like to know where he was on that day, and what his duty was. Any information would be of great help. Thank you so much for having this website. It has allowed me to finally track down my Grandfather’s ship he served on during pearl harbor and the war. He was a signal man named Dallas Foley, he served on the Reid from 1940 – 1943. It is fantastic to see the ship and listen to the accounts of the shipmates. I truly appreciate what you are doing. It is always a pleasant surprise to hear that someone has found our website and has a connection with someone found there. It is what makes it all worthwhile. I will pass your email on to our webmaster. I remember your grandfather well. We were not only friends in the signal gang (both of us were signalmen) but we went on many liberties together. As I recall, he was known as Flip Foley. Why he was given that nickname, I don't know. He came aboard the Reid almost a year before I did. He joined the Navy when he was 17. I have his key dates- birth, death, aboard the Reid and minimal info on what he did as a civilian. What else can you tell us about your grandfather? Where born? Any interesting stories about growing up, his parents? Why join the Navy? If you have pictures of him during wartime, wedding day, later in life, can you email them to me? If not, plz send them in mail and I will scan them and return them. Did he write up any of his war stories? We are setting up a section on the website for war stories and another for pictures of sweethearts. We also may set up a section of bio sketches of shipmates. We have recently started a trust fund to cover the costs of perpetuating our website, so that your grandchildren and great grandchildren will be able to find their ancestors. I was delighted to discover your web site this morning. My father was Leland Wayne Van Allen and was aboard the USS Reid when she sank. He was from Phillipsburg, Kansas and enlisted with his best friend, Truman D. Strong, after the attack on Pearl Harbor. I would be happy to share my father's navy photos with you. My father passed away February 25, 1992. Thank you for keeping his memory alive. I will pass your email on to our webmaster, like you, a son of a shipmate, and you may see your email on the website in the coming months. Also, we will take #15 off our "unknown" list and transfer his information to the master list of shipmates, along with his picture. The only information I have on your father is that he enlisted September 9, 1941, reported aboard the Reid November 19, 1941 and was a survivor of the sinking. Apparently our Reunion Group and he never made a connection. What can you tell us about your father? Where born? When? Any interesting stories about growing up? Why join the Navy? What did he do after leaving the Reid? What did he do as a civilian? If not living, when did he pass away? My brother found your newsletter via the History Channel, then on the web. He brought it to my attention and we both enjoyed reading it. Then, while further exploring, he found a series of pictures showing unidentified crew members (in your 2007 Vol # 13, no 3.) After asking me to look at the article, and consequently after I forwarded it to our dad's surviving sister and brother, we all believe that the picture of the man at the top left on page 10, picture #15 is a picture of Carl William Radebaugh, Rdm, aboard the USS Reid from Pearl and until/throughout her final action. After the sinking, Carl was rescued by a supply ship and, we believe, can be seen in another of the pictures in the same issue - that of a group of survivors being rescued aboard an LSI. There is a group of 4 men resting (above the very large rope) with their heads silhouetted against the water; because of his very unique hairline, we believe it is Carl who is sitting just below the man whose head is the highest of these 4 men in the picture. My brother had advised he would try to supply you with this information but I've never heard that he did. And its too important to me to not try. If you receive this e-mail, I'd be very interested in hearing from you and attempting to supply any other information I might. I remember Dad telling us that he was temporarily re-assigned to Washington D.C. after the sinking, to help serve as one of the clerical personnel for records of the crew members and and for notifying families. All this week the History Channel has been running a mini series about WWII. Last night (18 Nov.) they featured the battle that took place at Leyte in the Phillipines. I know that the Reid was a part of this because my grandfather served on and survived the sinking of that great ship. His name is William Halfpap. After watching that show, I went online and found ussreid369.org. I was thrilled to find 2 pictures of him on the site. However, sadly, he passed away on 12 May, 2008 after battling Alzheimer's Disease. He was very proud to have served on the Reid. He was the nicest, kindest person anyone could have met. He is greatly missed. I just want to thank you for the web site dedicated to the USS Reid. My grandfather would have liked it. Thank you for writing to me. Someone recently informed me of your grandfather's passing, although I can't seem to locate the record just now. It's discoveries like yours and letting us know, that make the website worth while. Most of the credit for the site belongs to Dr. James Wilson, son of a shipmate, whose dedication and creativity have made it possible. I served with your grandfather and knew him at the time. I served as a signalman on the bridge and he as a radioman on the deck immediately below. As we were both in the communications business, we had frequent contact. My name is Erin Aitken. I am writing you in hopes you may be able to contact former crew member and plank owner by the name of John G. Bradford. I am in possesion of his Honorary Plank Owner Certificate for the USS Reid (FFG-30) Commisioned on February 19, 1983. I moved up to Washington from California and bought this item at a garage sale for $2.00 because I thought it was preety neat. Then I had it stored away in a closet away from my little boys so they would break the glass after we relocated again I was going through my closet, and thought maybe he would like to have his certificate back. I dont know why or how he parted with it, but in case it had fallen in the wrong hands, I thought maybe he would like to have it back for sentimental purposes, or maybe pass it on to a family member. I can send it to him, no charge of cource, if he would like to have it back. If it was my fathers, I would want to have it. Hope you can help. Thank you for taking the time to search for the owner of what certainly qualifies as a family heirloom. I am the contact person for the third naval ship named USS REID DD369 whose website you found on the internet. The fourth ship named USS REID was Bradford's ship, the FFG30. I have attached a picture of that ship. It served the nation well for many years, but it is no longer a commissioned U.S. Navy ship. I am forwarding your inquiry to the first captain of the FFG30 and to a member of the first crew. I expect that one or both of them will be in touch with you. Thanks again for your concern in preserving the momento you acquired. Also in the last few days, we have upgraded our USS REID DD369 website, in case you are interested in the heritage of our WWII ship. Let me start by thanking you for this wonderful site. 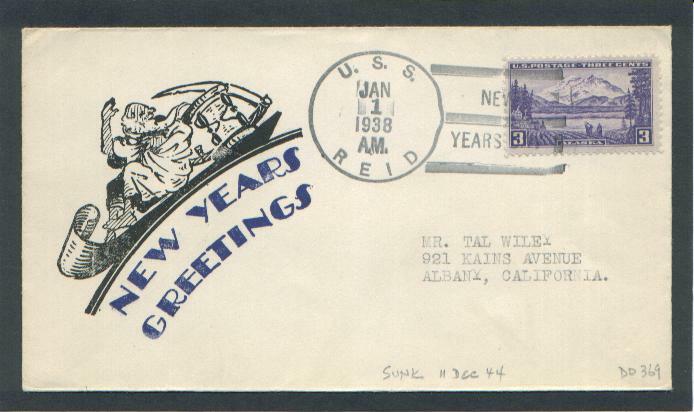 I just found it tonight and have enjoyed reading about the USS Reid . My uncle was one of crew that was killed.I would like to know if you knew him or anything about him or anyway I might find any information on him. His name was Howard Frederick Rawlings,20.Seaman First Class, from East Ocean View ,Virginia.His nickname was Smokey.Anything you can tell me would be greatly appreciated. I would like to thank you for your service to our Country and for the web site. If you are unable to help, I thank you anyway. Granddaddy retired from the Navy on 9/1/1956 with the rank of CWO-W-2 after 30 years of service. Thank you for keeping the information updated on the website. A lucky break, a long lost cousin of mine (also named Joseph Wieczorek) was doing some research on our Uncle Joe and came across my letter to you on your website. He sent me the attached photo and has promised to send some other family documents. I hope this photo will strike a memory from one of his shipmates who could tell us something about him and perhaps his last few days. Thanks for staying in touch and for doing such a wonderful job in helping all of your shipmates and their families to be able to communicate. My late father Philip Niessen served in the Navy during the War and was a Classification Specialist, SP (c) 3/c, stationed at Bremerton, WA in 1944 and 1945. During that time he kept a diary of his interviews (without names) and conducted interviews of the USS Reid survivors as they returned to the States. The notes on the Reid interviews are very brief but I thought that they might be of some interest to your group. Tonite we all had to work. 120 survivors came in from the USS Reid a DD announced lost due to enemy action in the 2nd Battle of the Philippines. They were brought back on the USS Nashville and arrived here this morning. All records were lost, of course, so a card had to be made out on every man. We also made up a SF form on each man and shore-duty scores on those who rated them. They came here from small stores where they were given the usual Navy tailoring job (too short or too long). None of them had contacted their families yet, who probably think they are lost. They are due to get their survivor’s leave tomorrow so we rushed them through. The Reid had been through quite a bit of action and some of the men rated 9 stars. They were a boisterous lot, and it was quite apparent they were all glad to be alive. 106 men were lost with the ship. They each had a thick packet of letters which they were given a few minutes before coming here and they kept themselves pretty busy reading these while waiting to be interviewed. They hadn’t heard from their families for a month or more. While I was filling out the SF form on one man, he was reading letters from his wife. He showed me a picture of his 2 year old girl. Attached to a page of the letter was two little candles from her birthday cake. He just smiled from ear to ear while reading the letter. One of the fellows I interviewed was 17 years old and had several months of sea duty already, climaxed by his ship being sunk. I wonder what I’d be like today if that had happened to me when I was 17. Q. – How was your ship sunk --- torpedoed? A. – Well – that’s what we were told to say. A. – We were suicide-bombed by a Jap plane. Q. – Well, that’s fairly common nowadays – why the mystery? A. – They don’t want information to leak out how effective suicide bombing is. The way I look at it is, it’s not only the damage to ships that is effective, it’s the mental impression that it makes on those it hits. The sight of a burning, twisting plane diving toward you for what seems like several minutes is rather hard on the nerves. There must have been 50 ships throwing up stuff at the plane that finally got us. Ten planes peeled off and each one went for a ship. Q. – How long were you in the water? A. – About a half hour – it wasn’t so bad. Most of the damaged ships in the yard were suicide-bombed. On the Reid two gun mounts were wiped out; most of the men lost were below deck. Sunk after being hit by 2 Kamikaze Planes in Ormoc Bay Leyte, Philippines, December 11 1944. I’ve already sent you an email but it was before I had the chance to go through this website. This is an incredible website and I was stunned to find a photo of my Grandfather. I’ve never seen that photo before. I was astonished. Thank you so much for keeping this site going and thank you again for serving and giving me an opportunity to live as well as I do today. The more I research the past the more I see how much we take everything we have for granted. We really don’t understand how easy our generation has it.